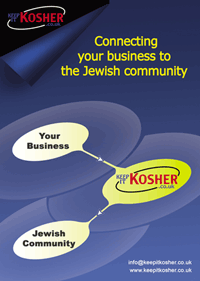 The All-New Keep It Kosher Site is COMING SOON!! If you're on this page, it's either because you've seen our flyers, or you've heard about the revamp that's taking place on Keep It Kosher. Very soon, the Keep It Kosher site is going to look very different. We've been working tirelessly behind the scenes to create the website that the Jewish community really needs. Whilst it's not quite ready yet (we're still ironing out any creases, crossing the t's and dotting the i's), when it is, it will be the most advanced site of its kind in the Jewish market - in fact, it'll be pretty high up there in any market! So what makes the new Keep It Kosher so different? Below is a quick idea of how a business can use Keep It Kosher to vasty exploit their online marketing potential, as well as just some of the features that are available with a premium listing. From the comfort of your own computer, you can add your business quickly and easily. Before long, you'll have your own page on the site dedicated to your listing. But unlike other sites, where that's that, with Keep It Kosher, that's just the beginning..
Why not let customers get up close and personal with your business by showing them exactly what you're all about. Restaurants might use this to show images of the food they serve, or the dining areas where the action happens. Venues might upload footage of a wedding ceremony, so potential customers can see what all the fuss is about. If you're a musician, why not upload some music - imagine a customer trying to find a good band for their special occassion, what better way than to be able to listen to the music of all the different prospective bands that they're interested in to help them make an informed decision?! Or why not upload some of your advertisements/flyers/posters, etc. - whatever you can think of, it all helps to sell your business to the customer. Special offers are an amazing way to both attract new customers and keep existing ones. With our unique and easy-to-use system, you can upload a special offer on the site (which automatically goes not only onto your own listing but also into our dedicated Special Offers section), and control every aspect of it - whether you want it to be a voucher (automatically generated for you), when you want the offer to start and expire, what the terms and conditions are - it's all in your hands! We even offer advanced options, such as the ability to limit the number of prints (if, for example, you want to entice people to your business by offering 80% off your product/service, but only for the first five people to click the voucher), the prints per day or the prints per user. If it sounds complicated, don't worry - it's really simple to use. If a position has become available or you're creating a new opening in your business, this is the ideal place to advertise your vacancy. Our system allows you to input all the details, and your vacancy will be automatically submitted into our main Job Search page. We even offer a way for our users to apply for the job through our site, and enable you to change the status of the vacancy to "filled" when you've found that perfect person. Your listing will include sections for users to leave reviews and suggestions. A good review can help a business for obvious reasons, but often businesses find that when a customer has a bad experience, they are very ready to write a damaging review which can mar their hard-earned reputation, without any way of being able to offer an explanation or "other side to the story". With Keep It Kosher, you will be able to reply to reviews - both good and bad - to try to give a balanced idea of your business to the users. As well as this, users writing their thoughts in the Suggestion Box will be able to choose whether or not they want the business to be able to reply directly to them - if they do, it allows an excellent opportunity to communicate with the customers directly. All this, and a whole lot more, is available to businesses who buy a Premium Listing. We only offer 2 types of listing - the Free Listing (it's free, honest), and the Premium listing, which offers the full range of features mentioned above, and lasts for one year. The yearly charge covers EVERYTHING - with one payment you can upload as much as you like, as many videos, offers, job vacancies - the lot! As we're yet to launch the new site, we want to keep our pricing under wraps, but if you're thinking it's going to cost a fortune, you're very wrong. Premium Listing prices will vary for different types of businesses (some, after all, will get more use out of it than others), but you can rest assured that THE MOST EXPENSIVE LISTING WILL COST NO MORE THAN £150 PER YEAR. Hardly breaking the bank, is it? It's also worth noting that ALL REGISTERED CHARITIES WILL RECEIVE A PREMIUM LISTING ABSOLUTELY FREE OF CHARGE!